I receive deliveries every other week of fresh fruits and vegetables from a company called Boston Organics. I really enjoy these deliveries because it helps to keep me on a budget (going to the grocery store I ALWAYS end up spending more than intend) helps me to eat as much organic produce as possible, and sometimes introduces me to new fruits and veggies that I may have never tried before. I get deliveries every other Tuesday, so I have to be very systematic about the order in which everything is consumed...for example, a butternut squash could last nearly a month, but a head of green leaf lettuce is going to start to get wilted in a couple of days. I do have the option to not receive certain items that I won't use or don't like, but for the most part I am open to anything ... This is my lunch a couple weeks ago that used up some of my organic box leftovers. 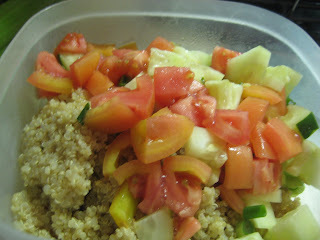 I made a cold salad on leftover quinoa with tomatoes, cucumbers, scallions. Even though quinoa is a grain that is a complete protein, I added some chicken to help keep me full longer. I dressed this with olive oil and lemon juice, salt, pepper and garlic powder. I would also like to read his books The Omnivores Dilemma and In Defense of Food...Anyhow, I have been striving to get all my fruits and veggies in my diet, and by focusing on that, I feel like I have inadvertently cut out a lot of excess junk. It has made me a little bit better about ordering food when I eat at restaurants. 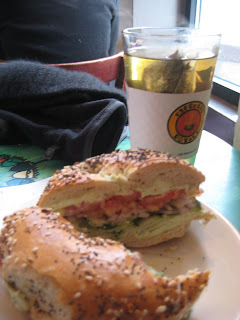 Here is a great example...my favorite Boston bagel place....Bagel Rising...I used to get the Sunrise Sandwich. A bagel with a bacon, egg and cheese. I've recently switched to getting an everything bagel, with garlic herb cream cheese, tomato, cucumber and red onion. Here it is beside some jasmine green tea! I find that it actually keeps me full longer, but keeps me from getting that really groggy, ate too much junk feeling. YUM!